Yoga Direct's Extra Long Yoga Mat was specifically designed for tall yogis! At 84 inches long, this mat is a full 16 inches longer than the standard size yoga mat (standard is 68 inches). Made of durable non-skid PVC foam, this sticky mat is also double thick 1/4 inch, providing ample joint support and cushioning. Sometimes you need the extra space to get a great stretch. The Extra Long Yoga Mat was made for those who want to try new poses, needed the space, and want to experience the ability to move around. Are you looking for a wider mat too? 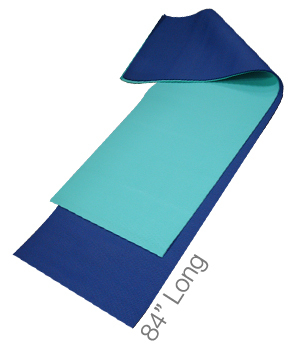 Checkout our extra long, extra wide yoga mat as well! Each extra long mat is individually wrapped for resale and can be custom printed with your studio logo. To accommodate taller Yogis, it is best to have some of our Extra Long Yoga Mats in stock at your studio or gym. Made of durable foam with a high-tack surface for stickiness, our extra long Deluxe Mat is longer than most mats, and is the highest quality available. This Extra Long sticky yoga mat is machine washable and as with all of our Yoga Mats, the Extra Long Mat can be easily stored, cleaned, and rolled up after class. Each Extra Long Yoga Mat arrives individually wrapped, and can also be custom printed or branded with your own company or studio logo or design. A great length, nice and thick under the feet, and very comfortable when just lying on it. Cannot beat this mat. People will be super happy and pleased with this purchase. I'm 6'4" tall, so the mat is long enough for me. Seems to be of decent quality too. The mat arrived quickly after purchasing and I've had no problem with the seller. I asked for this mat for Christmas after reading all the reviews. I absolutely LOVE it! It is the first time in five years that my feet are not sticking off the mat or I'm not checking to see if my head is still on the mat while lying down.I'm 5'9" and I won't go back to a regular length mat again. Very little odor to the new mat - I aired it out before first use. I found the stickiness to be just right. I think it is a great value! Originally I ordered 2 mats, I liked them so much I ordered 4 mats for friends. I recently ordered 6 more mats for Christmas gifts. Do I like them? YES YES YES, The length is great, the thickness is great, and everyone in my local fitness center loves them. Great price, great product. I bought this extra long mat because the mat I had before had a surface that was very slippery and because I'm a tall guy. This mat's surface is slip resistant and much better than the one I had before. awesome awesome awesome! i don't know why anyone would ever buy a 'regular' mat - this one should be the new standard! I only wish they come a bit 'wider' - however I love it! Nice and long, keeps my hands and feet on the mat instead of the floor. now that was just what I ordered and got!! !